The artillery of the Imperial Guard, which grew into the Grande Armée’s artillery reserve, had inconspicuous beginnings. It originated with the light artillery detachment of Napoleon’s Guides; part, if not all, came back from Egypt and was incorporated into the new Consular Guard before Marengo in June 1800, where a small company served (and lost heavily). By 1802 Songis was the commander of the Guard artillery, which was composed of two artillery companies and a train company. In 1804, when the Consular Guard became the Imperial Guard, there were only two companies of horse artillery and two artillery train companies. Two years later, the horse artillery had grown into a regiment of six companies, accompanied by six companies of the train battalion. One of the artillery companies was Italian. They were the pick of the line, and were well trained and equipped. By 1808, Napoleon had ordered Colonel Drouot to organize a Guard foot artillery regiment. Three companies were first organized, and served excellently at Wagram. Additionally, three companies of “conscript artillery” were formed, later becoming Young Guard artillery. When the foot artillery regiment was formed, the Guard horse artillery regiment was reduced to two squadrons of two companies each. After the war with Austria in 1809, Drouot finished organizing his regiment of foot artillery, giving it a band and sapeurs, and finally issuing it with bearskins in place of the shakos the men had previously worn. By 1813, the Guard had six companies of horse artillery, and six of foot artillery, both classed as Old Guard; one company of horse artillery; and fifteen companies of foot artillery classed as Young Guard. The artillery train had become a regiment of twelve companies, and there was a company of ouvriers and pontonniers, and a Young Guard artillery train regiment was formed as an adjunct for the Young Guard artillery companies. When the Guard artillery was being overhauled and rebuilt after heavy losses in Russia, some of the troops were drawn into it from the excellent and well-trained Artillerie de la Marine, who also served as infantry, forming four large regiments assigned to Marmont’s VI Corps. They were issued dark blue overcoats like those of the Imperial Guard, and fought so stoutly at Lützen that the Allies thought them to be Guard infantry. The Guard artillery served as the army artillery reserve from 1809 until the end of the Empire. As such, it formed the major part of Lauriston’s huge 102-gun battery at Wagram in 1809, suffering such heavy losses that it had to be reinforced with Guard infantrymen. Coignet stated that when the Guard infantry was asked for volunteers, everyone wanted to go. It participated in Drouot’s artillery attack at Lützen in 1813, as well as the decisive element at Hanau the same year. It also formed the artillery mass that blew out the Prussian center at Ligny in 1815, as it had the Allied center at Lützen, again paving the way for the decisive assault by the Guard infantry. The Guard artillery gave the Emperor a reserve of highly trained, well-equipped, and very motivated artillerymen who could perform any artillery mission assigned to them. The Guard artillery held annual gunnery (shooting) contests at La Fère. Guns and equipment were always kept in the highest state of readiness, and even in the first battles of 1813, with many inexperienced gunners in the ranks, they fought excellently, generally outperforming their Allied opponents. One interesting situation developed in the Guard artillery between the officers who had been “school trained” and long-service officers who had ended up in the artillery or had been promoted up through the ranks and had never been to a formal school. They were experienced officers, but they were now were being considered as “unqualified” because of a lack of schooling. They were long in experience, however, and the common-sense decision was finally rendered that they could keep their status and station. The ammunition load and projectile capacity for the French pieces of the Gribeauval System were as shown above. One type of canister contained 42 large lead bullets according to Gassendi, and the other between 60 and 100, depending on the caliber of the gun. At the highest elevation, the range limits for the 12-, 8-, and 4-pounders were 1,200, 1,500, and 1,800 meters. The maximum range with roundshot for the same three calibers was 800- 900meters for the 12-pounder, and 800 and 700 for the 8- and 4-pounder. Canister range was 600, 550, and 400 meters for the 12-, 8-, and 4-pounder. The 6-inch howitzer used a fused shell that could be exploded between 700 and 1,200 meters. Its bursting radius was 20 meters. The fuse, like the primer, was a hollow reed, “about 8 cm long filled with strands of match impregnated with a compound of powder, saltpeter, sulphur, and pitch.” The fuse had a burn time of between 3 and 4 seconds, the flight distance of the round being about 600–800 meters. It should be noted that the new 5.5-inch howitzer that replaced the 6-inch model was sometimes termed the 24-pounder howitzer. One officer of the Guard artillery, Major Boulart, left an interesting memoir of his service in the Grande Armée. One story he related took place after the bloodbath at Essling in May 1809. He had been hotly engaged against the Austrian artillery, dueling outnumbered, and had suffered some loss. After the battle he met Napoleon, who stopped to question him about his unit’s performance, the losses he had suffered, and how he was going to replace what he had lost. He informed the Emperor precisely what shape his unit was in, and that he had one gun that needed a vent replaced and would have to go to the armory for repair. Napoleon, seemingly displeased, demanded to know why this problem had not been taken care of earlier, and, not waiting for Boulart to reply, told the unhappy officer that he would inspect him the next day and that he expected him to have all of his pieces in serviceable order and present for action. Boulart went to his superior, told him of his apparently insurmountable problem, and was given permission to procure one of the captured Austrian pieces of the same caliber for the purposes of the inspection and to keep it until his original piece was returned, repaired, from the arsenal in Vienna. Boulart did so, and when Napoleon showed up the next day at the appointed time and place, he asked Boulart if he was prepared for inspection. Boulart told him he was, how he had brought his battery up to strength, and waited the Emperor’s pleasure. Napoleon smiled at him, told how pleased he was, and informed him that he did not need to be inspected. Undoubtedly, he wanted the good Major Boulart to have his full complement of artillery and found the correct way to motivate him, Napoleon’s personal inspections being somewhat dreaded in the Grande Armée. French artillery tactics and employment stemmed from the doctrine taught in the excellent artillery school system developed after 1763. Artillerymen were taught to cooperate closely and support infantry. That being so, and the army in 1792 being organized in permanent divisions in the field, each with its own attached artillery, the principles of combined-arms tactics between the infantry and artillery was employed, experimented with, and developed. Artillery companies were used to support both troops in formation as well as in open and skirmish order. Attacks delivered in column or line, with large bodies of skirmishers deployed in front, were also supported by artillery, sometimes as far forward as the skirmish line itself and not just on the flanks of the units. Whenever possible, artillerymen massed their fire, employing at least two batteries to gain either local fire superiority or to destroy opposing infantry. Counterbattery fire was discouraged: it took too long and used up much of the ammunition allocation. On many occasions it was ineffective, and it took artillery away from supporting their own infantry and cavalry. The rule of thumb used by artillerymen was that if the enemy’s artillery was hurting your infantry more than you were hurting theirs, then there was a need to engage the enemy’s artillery. Light guns were best, as they had a higher rate of fire than the heavier 12-pounders (sustained rates of two rounds per minute versus one per minute). Battery commanders would mass their fire on one enemy gun at a time, killing or wounding the crew or disabling the gun, then move onto the next one. That was much more efficient than targeting an entire enemy battery with one French battery. If multiple batteries were to be used, they would do the same thing but on a larger scale—concentrate one battery per gun of the enemy, and so on until the enemy artillery was knocked out. French artillerymen usually chose positions on low hills or other eminences in the terrain with good fields of fire and little or no dead ground to the front and flanks (though howitzers might emplace in dead ground which offered sufficient cover and concealment). Artillery seldom took position directly behind friendly troops, for two reasons: first, the troops did not like it, as a round could fall short and cause friendly casualties; and secondly, the reaction of those troops to their own artillery might be detrimental to the offending artillerymen’s state of mind and personal safety. Artillery was usually employed massed. Napoleon massed a considerable 30-gun battery at Lodi in 1796 to support the closed-column rush across the bridge. A 25-gun battery was employed on the Landgrafenberg at Jena in 1806 to support Lannes against the more numerous Prussian guns. In that same battle, French horse artillery was used to support French infantry in column, in line, and in open order, along with light cavalry, to defeat Grawert’s division, as well as Ruchel’s later in the day as it arrived on the battlefield when the rest of Honenlohe’s army was falling apart. Increasingly after 1807, massed artillery was brought forward rapidly into canister range in order to “blow away great sections of the enemy’s line” and thus to seek a quick decision. This tactic was pioneered by Senarmont at Friedland in 1807, and was used to good effect at Ucles, Ocana, and Somosierra in Spain, as well as by the great 102-gun battery commanded by: Lauriston at Wagram in 1809, which not only covered a tactical corps change of front but preceded Macdonald’s famous attack that shattered the Austrian line. The best example of this tactic, however, was undoubtedly Drouot’s artillery attack at Lützen, in which his 80-gun battery completely blew the center out of the Allied line, paving the way for the decisive assault of the Guard. Further examples occurred at Hanau, at Ligny, and at Waterloo, as well as at Raab in 1809. 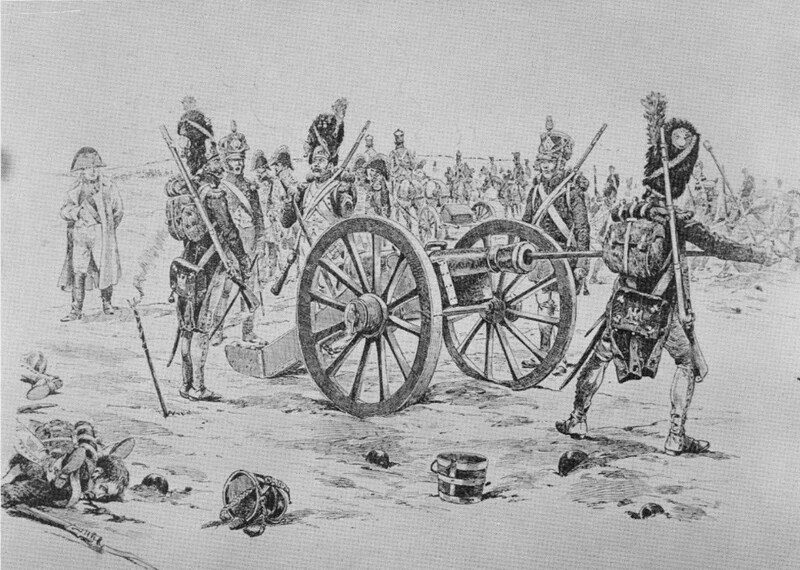 On the defensive, French guns were “fought to the last extremity,” gunners making combat with handspikes and rammer staffs (which could inflict serious injury if they connected with a vital part such as the skull), as the Guard artillery did at Hanau, helping fight off Allied cavalry until the Guard cavalry counterattacked. When the enemy was in columns, he was engaged head on; if in a linear formation, French commanders attempted if at all possible to get onto his flanks for enfilade fire. The French used their guns to gain every possible advantage. While it was abhorrent for an artilleryman to lose his guns to the enemy, French artillery commanders would risk this in order to gain a decisive advantage on the battlefield. Poniatowski used his guns in his skirmish line; Foy, a horse artilleryman, had as his dictum, “Get up close and shoot fast.” Interestingly, the elite British horse artillery considered their French counterparts to be more daring than they were themselves. When necessary, howitzers were massed for special missions, as at Borodino, where they lobbed shells into the Russian field works, and at Waterloo, where they were massed against Hougoumont on the British right flank. They were also massed at Dresden against a fortified village on the French left flank. Sometimes, howitzers were emplaced in low points in the ground so that only the heads of the gun crews were visible. One Russian artillery commander was faced with this situation, but could not fire at them, as their licornes were unable to elevate to a sufficient degree to fire into the depression. There were no written French artillery regulations. The Guard finally had an unofficial set of rules published in 1812, but the French artillerymen were taught their doctrine in their schools, and were constantly trained in its application. They also learned by experience, especially in the early days of the Revolutionary Wars, when they were usually outnumbered by the Allied artillery—especially the excellent Austrian artillery. What they learned they applied, and they fielded the best overall artillery arm during the wars. French command and control was excellent. French corps artillery chiefs were, with few exceptions, general officers; one reason undoubtedly was to prevent their being intimidated by the infantry and cavalry generals or by their own corps commanders. In the chain of command, it was quite different being a senior field grade officer attempting to advise or convince a general or marshal than being a fellow general officer with an established reputation. One of the problems with common-sense artillery employment in other armies was that their artillery chiefs, except at the army level, were usually not general officers, and were not listened to because of their relatively low rank and low level of expertise. The corps artillery chiefs also had their own staffs, and the army artillery staff backed them up. It was no disadvantage that their commander-in-chief, Napoleon, was also an artilleryman— and their Emperor to boot. For this reason, Senarmont could convince his corps commander at Friedland, Victor, to let him use the corps’ entire complement of artillery for an unsupported attack on the Russian center. Battery operations and employment were simple and straightforward. First, guides from each gun crew staked out their gun’s position, which the horse team would gallop into. As the horses came to a halt, the crew would first change the gun tube from the traveling to the firing mode (if an 8- or a 12-pounder; 4- and 6-pounders did not require this added duty), and then unlimber and lay the piece. The guns were normally about 20 meters apart, but that was always dependent on the ground. The limber would usually stay close, and the prolonge would be attached from the trail of the piece to the limber. Caissons, one per gun, would be positioned about 50 meters to the rear, usually under cover to protect the horse teams. Ammunition coffrets would be taken from the trail of the piece and placed on the limbers, opened, and one round brought to the muzzle of the piece and loaded on command. The gun would be laid, aimed, and primed, and then the gun captain would await the company commander’s “Fire” order. Allied and client-state artillery grew in importance from 1807. Dutch horse artillery had an excellent reputation and served well in Spain, notably at Talavera in 1809. Strength differed from year to year, the Dutch becoming excellent at shuffling their units around in constant reorganizations, “undoubtedly to conceal their actual weakness from Napoleon.” Their horse artillery went from four companies in 1807 (one being assigned to the Royal Guard) to two in 1809, and the Dutch foot artillery was a four-battalion regiment that year. The Army of the Grand Duchy of Warsaw had excellent artillery, both horse and foot, and included a company of pontonniers, an artillery train battalion, and a company of artificers. Its equipment was a mixture of captured Prussian and Austrian. In 1810, by the royal decree of 30 March of that year, the artillery consisted of a Foot Artillery Regiment of 16 companies, four of which were field artillery, and a Horse Artillery Regiment of four companies. The foot artillery companies each had five officers, six NCOs, six artificers, two drummers, one enfant de troupe, and 108 enlisted men, the horse artillery companies five officers, ten NCOs, two trumpeters, eight artificers, two enfants de troupe, and 144 enlisted. Field artillery companies manned a division of guns consisting of four 6-pounders and two 6-inch howitzers; horse companies served the same type and number of guns. There was only one company of foot artillery serving 12-pounders, and six with no attached howitzers. In June 1811, a supplementary artillery battalion was formed, with eight companies. Eugène’s Kingdom of Italy, of which he was Viceroy, and the army commander-in-chief, had a large artillery arm. Six companies of horse artillery and twenty-six foot artillery companies, plus a company or two of pontonniers and the requisite artillery train troops, made up the strength. Because of a chronic shortage of horses, oxen were sometimes used by the train units instead of horse teams. 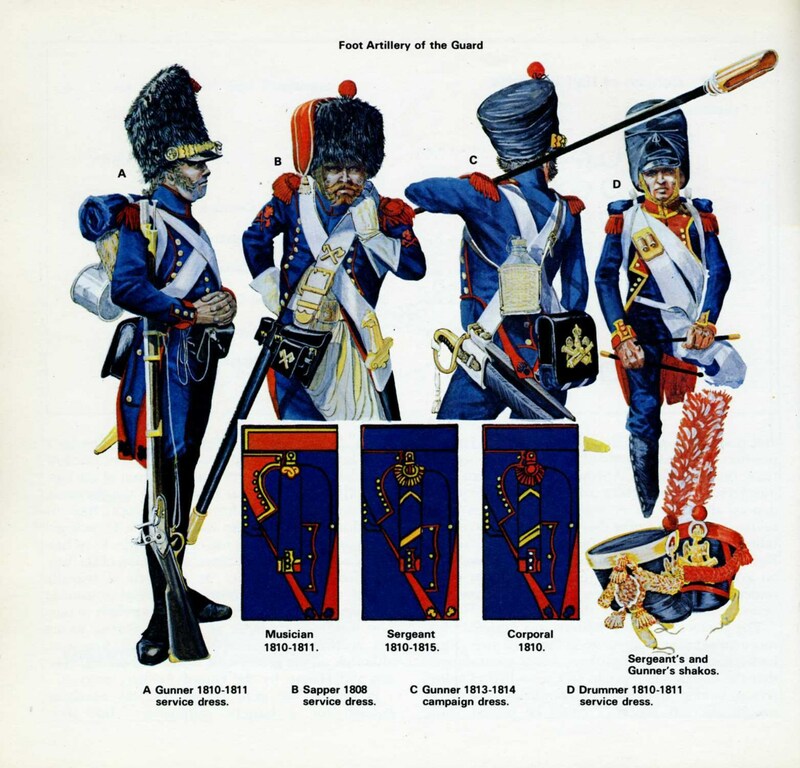 The Royal Guard, a miniature version of the French Imperial Guard and similarly organized and uniformed (except that the Italian national color of dark green replaced the French blue), had a small, expert artillery contingent. It consisted of one company of horse artillery and one company of foot artillery, and a train “detachment” to pull them. The Danes had a small but efficient artillery arm, consisting of both foot and horse, sometimes referred to as “riding batteries”. However, the two horse artillery batteries were equipped with a largely useless 3-pounder gun that was too light for effective service, and in 1813, Davout issued them more useful French and captured Allied pieces. The Danish rocket company, commanded by Captain Schumacher, had a strength of 85 all-ranks—four officers, eight NCOs, one trumpeter and 72 privates. They were on active service, engaging the Royal Navy from Langeland Island, and the company was eventually increased to 114 all-ranks, an designated the Raket Corpset (Rocket Corps). There is no evidence that Schumacher’s Rocket Company was part of the “Auxiliary Corps” that supported Davout in northern Germany in 1813–14. The Confederation of the Rhine, Napoleon’s most important military ally, consisted of a multitude of minor German states, the most important, and generally the most enthusiastic, being Baden, Hesse-Darmstadt, Saxony, and Bavaria. All of these states possessed solid artillery arms which rendered good service during the course of the wars, their most important contribution probably being in the 1809 war against Austria. Baden had one artillery battalion of three companies, one of them, the 1st Company, being horse artillery and the other two foot artillery, plus the requisite train troops. The 3rd Company served in Spain, giving excellent service. Its misfortune at the Battle of Talavery in 1809 got Senarmont in trouble for taking the time to write to the Grand Duke telling him of their good and loyal service. Baden’s artillery contingent had always enjoyed a good professional reputation, usually contrary to the rest of the army. The Badeners were “highly prized” by the French, and thought to be on a par with the French artillery. They were well-trained, and their artillery material and guns were of excellent quality. Bavaria had the largest contingent of any Confederation state, and its artillery regiment had four battalions of five companies each. There was an artillery train battalion, which was militarized in 1806. The Bavarians prior to 1813 gave excellent service: they were part of Lauriston’s large 102-gun battery at the Battle of Wagram in 1809 and did particularly well in Russia with St Cyr on the northern flank. In 1809, the Bavarians had a regiment of twenty companies, thirteen of which were assigned to the field army, which became the VII Corps under French Marshal Lefebvre. The batteries were of three types—line, light, and reserve. The line and light batteries were assigned the same ordnance, four 6-pounders and two howitzers. The gunners in the line batteries walked, and those in the light batteries either rode the limbers or were mounted. The reserve batteries manned four 12-pounders and two howitzers, and they were assigned to the corps reserve artillery along with one of the light batteries. 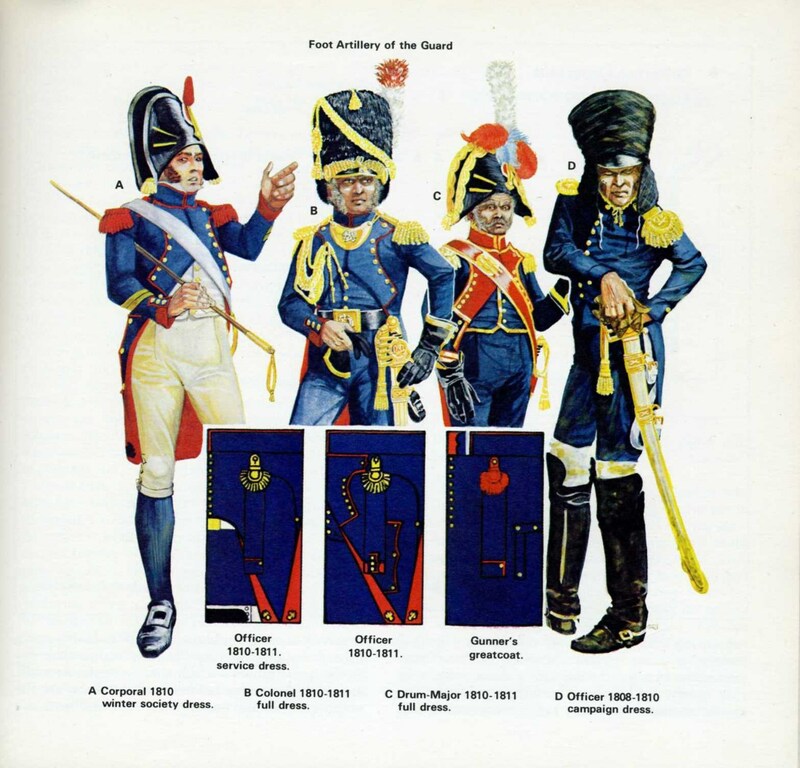 The train battalion (Fuhrwesenbataillon) had been militarized in 1806 and were an efficient organization, proud to now be soldiers and carrying arms and wearing the Bavarian Raupenhelm. Hesse-Darmstadt fielded “excellent troops, raised from a population with a tradition of worldwide mercenary service.” They manned one battery of foot artillery, five 6-pounders and one 7-pounder howitzer. They also had a recently militarized train company of 108 personnel that was still short of equipment, such as harness and saddles, and some of the personnel were either poor riders, or no riders at all. Still, the artillery contingent served well. In 1812, they “marched with the Young Guard,” and brought all their guns home. The Saxon artillery school was founded in 1766 with a small staff which included a director from the artillery staff, four officer instructors, and four NCO assistants. It was relatively efficient in the period of the Seven Years’ War, but little or no progress was made in the artillery arm from that time through 1809. Becoming inefficient because of a lack of training and shortages in equipment, the Saxon artillery was reorganized in 1810 into a foot artillery regiment of three brigades, with a total of 16 foot companies, and a horse artillery brigade of two companies, plus sufficient train troops to get the four brigades into the field. This was a far cry from what had been available in 1809. The Saxons fielded no horse artillery, and horses were in such short supply that battery officers also served on foot. Units trained together but once a year, and the batteries were organized only following orders for mobilization. Just four batteries were sent to the field for service with the IX Corps under Bernadotte, each made up of four 8-pounders and two 8-pounder howitzers. The artillery of 1809 was the weakest arm in the Saxon Army. The Saxons also had a company of artillery artificers to take care of, and repair, their equipment. New guns, lighter and with a better performance than the older pieces, were also developed. A new 12-pounder, a 6-pounder, and an 8-pounder howitzer were used to great effect, though the older weapons were kept at the depot. For the 1812 campaign in Russia, the Saxons fielded four-foot, six regimental artillery, and three horse artillery companies. These performed excellently along the southern flank of the Grande Armée under Reynier. The reorganization of 1810 provided for a foot company of four officers, twelve NCOs, sixteen artificers, two drummers, and 98 enlisted men. The horse artillery brigade consisted of ten officers, eighteen NCOs, two surgeons, four trumpeters, two farriers, and 204 enlisted men. Württemberg fielded probably the best and most efficient army in the Confederation. In 1809 the state had three companies of artillery, two horse and one foot, one of the horse companies having Guard status, for a total of 22 pieces of artillery. The horse artillery manned four 6-pounders and two 7-pounder howitzers for each company, and the foot artillery company had eight 6-pounders and two howitzers. There were eighteen caissons with the companies and a further twelve in the park. The French looked upon the Württembergers as military equals, Ney remarking in 1812 that his Württemberg horse artillery was as good as his French companies, and probably better-high praise indeed. The Württembergers were described as a “tough, dashing arm,” and they could think for themselves in a pinch. However, in 1812 their field forges could not keep up with the generally hard marches, and so the artilleryman improvised their own from “Russian farm wagons and the forges and tools of local blacksmiths;” clearly, they could make bricks without straw. This entry was posted in Artillery, France by MSW. Bookmark the permalink.